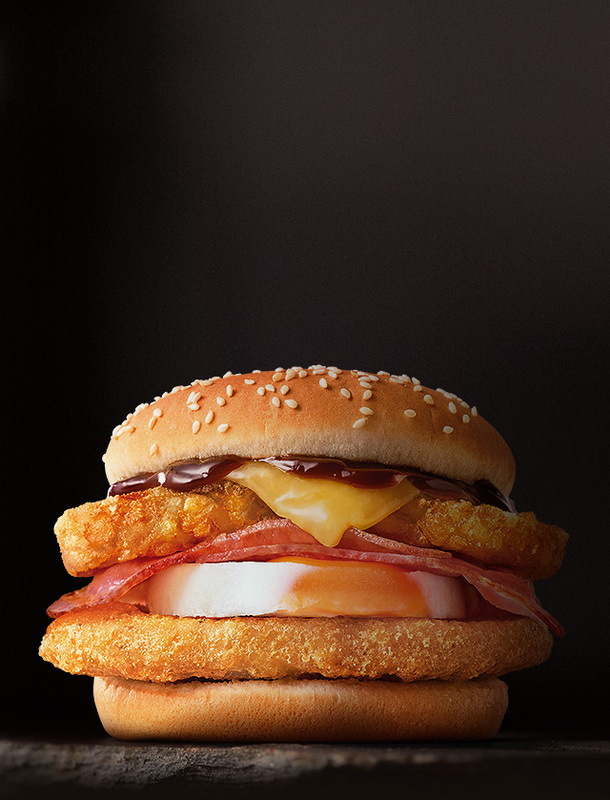 Delicious barbecue sauce, sizzling bacon, melting cheese, a freshly cracked egg, crispy hash brown and succulent 100% Australian Chicken breast. All in a toasted sesame seed bun. HASHBROWN: Potato, Canola Oil, Salt, Dextrose (from maize), Emulsifier (471), Preservative (450), Antioxidant (330), Natural Pepper Extracts. HASHBROWN: Potatoes, Canola Oil, Salt, Dehydrated Potato, Black Pepper, Disodium Dihydrogen Pyrophosphate, Dextrose. HASHBROWN: Potatoes, Canola Oil, Dextrose (220) (Maize), Seasoning (Black Pepper, Salt, Modified Corn Starch). HOUSE GRILL BBQ SAUCE: Tomato Pulp [Antioxidant (330)], Sugar, Vinegar, Water, Onion Puree, Thickener (1422), Molasses, Minced Garlic [Acetic Acid (260)], Salt, Lemon Juice Concentrate, Spices [Including (100)], Mustard (Wheat, Soy) [Food Acid (260)], Flavourings, Malt Extract (Barley), Vegetable Gum (415), Yeast Extract, Preservative (202). CHEDDAR CHEESE: Pasteurised Milk, Salt, Starter Cultures, Rennet, Lipase. HASBROWNS may contain TRACES of sulphites. McCHICKEN PATTIES & HASHBROWNS are cooked in McDonald’s Vegetable Oil blend.